1969 was very special year in Freemasonry as a very special person was initiated – his name is Peter Dawson. It is always a pleasure to attend a 50th celebration as you discover a whole host of new things about someone that you thought you knew quite well. You learn a lot about the man and the Mason. Chorley Lodge No 6287 was privileged to be able to celebrate such a special occasion with Peter Dawson. 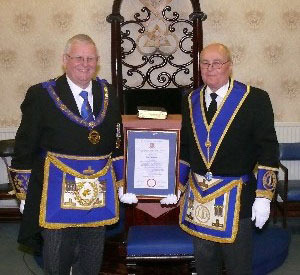 The lodge was opened by the WM Andrew Howarth, following which, the lodge was honoured by the presence of Assistant Provincial Grand Master Stewart Seddon. Stewart was offered the gavel of the lodge, which he accepted. He told the members of Chorley Lodge and their visitors that Peter was born in 1941 and went to work at Leyland Motors Ltd. He had enjoyed a wide and varied career during his time at ‘Motors’, working his way from apprentice to Assistant Transport Manager. Peter finished his career as museum manager of the British Commercial Museum. He met his wife Adrienne at the Wigan Empress Ballroom. They have been happily married for 57 years and have three sons, Michael and twins Andrew and Simon as well as five grandchildren and five great grandchildren. 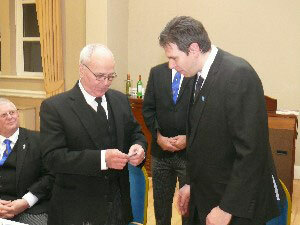 WM Andrew Howarth (right) presents Peter Dawson with a 50 years pin. Stewart went on to detail Peter’s Masonic career saying that Peter’s journey through Freemasonry began on 17 March 1969 when he was initiated into Duxbury Lodge No 5930. He became master in 1982 and again in 1992. Unfortunately, Duxbury Lodge handed in its warrant, so he joined Standish Lodge No 4955 and then finally joined Chorley Lodge. Peter was promoted to the rank of PPrAGDC in 1993 and promoted to the high rank of PPrJGW in 2001. He was exalted into Chorley Chapter No 6287 in 1971 and served as first principal in 1987. He attained the rank of PPrAGSoj in 1994. The celebration concluded with the Chorley Group Chairman Peter Lockett reading a personalised certificate marking Peter’s 50 years in Freemasonry issued by the Province which was then presented to Peter by Stewart. The social board followed, allowing Peter to celebrate with his colleagues of Chorley Lodge along with friends from his mother lodge, Duxbury Lodge as well as those from St Anne’s Lodge No 2457 and a contingent from the Wirral. Peter Dawson (centre right) and Stewart Seddon (centre left) accompanied by grand and acting Provincial grand officers.